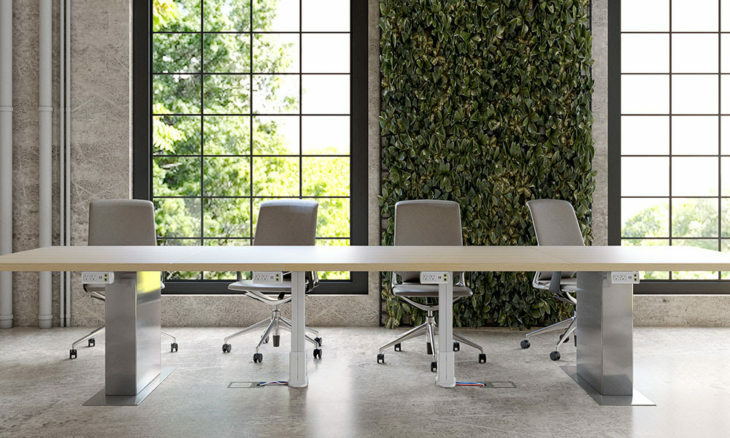 FSR, a leading designer and manufacturer of power, data and audio/video solutions for the contract office furniture industry, is introducing a simple, economical and elegant solution to camouflage and manage the unsightly gaggle of wires and cables necessary for today’s connected workspaces. 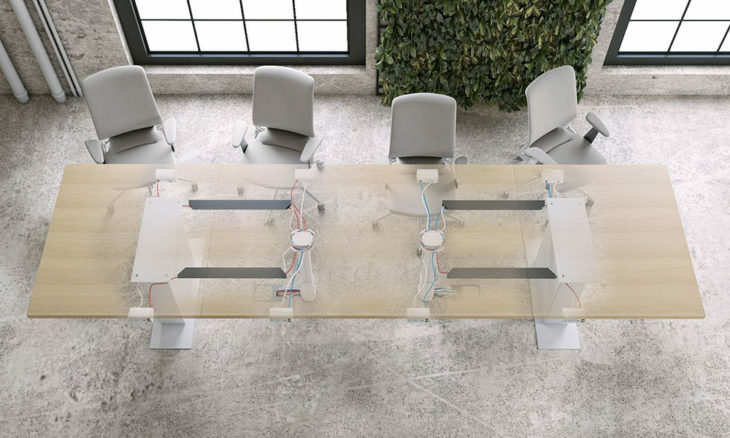 Ideal for collaborative environments, such as conference, board, huddle and class rooms, the new Concertto cable management collection provides an attractive housing and management system for cables and power in furniture that lacks a design element capable of serving as a conduit from table boxes to the floor, such as a pedestal. The Concerto collection comprises three modules: 1) An Under Table Channel for dressing cables horizontally along the table underside; 2) A simple-to-install, easily integrated Cable Pathway for transporting multiple low-voltage AV/Data and AC cables from the table’s underside to the floor; and 3) An Under Table Rack that can easily be mounted under most conference and huddle tables to provide storage and security for AV, digital, or data equipment. 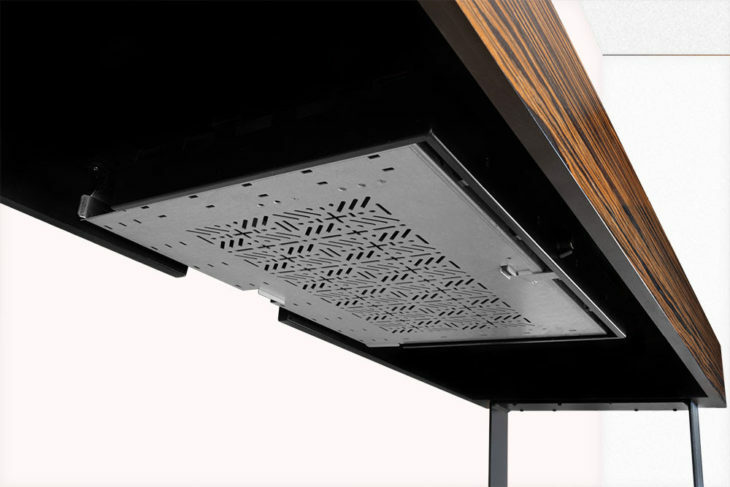 The components all feature ease-of-accessibility for upgrades or servicing and allow cables to be added or removed as needed. 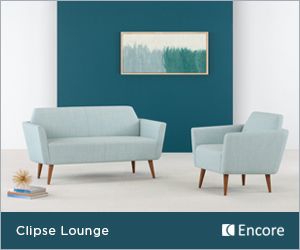 “FSR is proud to introduce the new Concertto Cable Management Collection to the contract furniture community,” says Jan Sandri, FSR president. “Concertto transforms cluttered and messy areas into neat, comfortable and functional workspaces that encourage productivity. 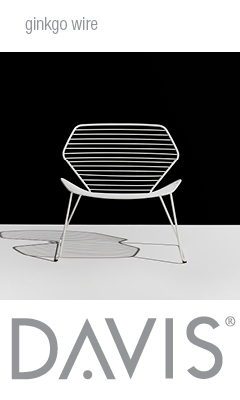 The collection addresses today’s need for advanced communications and connectivity in the office and boardroom with a clean and visually appealing place to work. FSR, established in 1981, manufactures a wide variety of signal management and infrastructure solutions for the AV/IT, Information and Communication Technologies (ICT), corporate, education, hospitality, government, and religious markets, including floor, wall, table, and ceiling connectivity boxes and wireways, as well as a full line of interfaces, distribution amplifiers, matrix switchers, seamless scaling switchers and HDBaseT signal delivery solutions. FSR offers live 24/7 technical and sales support throughout the country from expertly trained technicians and sales representatives. The Company is also an HDBaseT Alliance Adopter Member. For more information: www.fsrinc.com.